Learn To Dive With A-1 Scuba Today! Have you always wanted to try scuba diving? We offer many options for beginner scuba classes to fit your schedule so you can start your certification now! Not quite sure about scuba diving yet? Sign up for our Try Scuba course first to see just how amazing scuba can be! Get Certified In 2 Easy Steps! Not Sure You Want To Get Certified Yet? Try Scuba First Starting At $35! 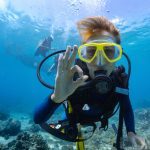 Our Try Scuba Diving Experience is fun, easy to do and in no time at all we’ll have you be blowing bubbles underwater, doing summersaults, and just about any other fun thing you can imagine. 70% of the world lies just below the surface. This class is the first step towards exploring the underwater world. Take your first step with confidence with helpful tips and suggestions to make the most of your glimpse into the watery world.